Much like in the Czech Republic, CEFC in Georgia touted investments that never came, and coopted local political elites – with the help of some colorful characters. The once high-flying Chinese conglomerate CEFC (中国华信) has in the last year suffered a series of devastating setbacks on a global scale. Last week, a trial opened in New York with the head of CEFC’s non-profit wing (China Energy Fund Committee), the former Hongkong politician Patrick Ho (何志平), arrested in November 2017 in the U.S. and indicted for high-level corruption in the United Nations and Africa. Shortly after Ho’s arrest, his direct supervisor and Chairman of both the non-profit and the main commercial company CEFC China, Mr. Ye Jianming (叶简明), disappeared in China, presumably investigated by the Party’s disciplinary machinery. The only direct mention of him since his disappearance has been a CCTV report accusing him of bribing the provincial Party Secretary in Gansu. A detailed investigative report in the respected financial portal Caixin published, and quickly censored, on March 1, described CEFC business practices as essentially a complex Ponzi scheme, based on fictitious transactions among CEFC’s many branches and affiliates in order to inflate trade volume and raise credit from Chinese banks. Whatever the business model was that had brought CEFC on the Fortune 500 index, it quickly collapsed after the Chairman’s disappearance. The accumulated debt finally caught up with the company, and CEFC defaulted on its bond and other obligations. Its major deal to buy a 14% stake in the Russian behemoth Rosneft fell through. Distressed assets around the world acquired during CEFC’s short-lived buying frenzy are now being taken over by the Chinese state investment agency CITIC. This spectacular corporate and political downfall made headlines in mainstream media around the world. Yet there remain places seemingly unaffected by the whole fiasco where CEFC manages to keep going as though nothing happened. In the Czech Republic, the disgraced and disappeared CEFC Chairman Ye Jianming remains an advisor to President Miloš Zeman, despite his conspicuous absence. In the United Nations, CEFC non-profit arm involved in the bribery of not one, but a whole series of UN General Assembly Presidents, keeps its affiliated NGO status in the Economic and Social Council (ECOSOC), without so much as an investigation proposed into its activities in the global organization. Yet the one place where CEFC is making its last stand without much notice from either the local public or the international community is Georgia. The story of CEFC activities in the country is as grotesque as anywhere – and still ongoing. CEFC expressed interest in investing in Georgia. The head of the government provided investors with detailed information about Georgia’s investment opportunities, including energy, financial and tourism sectors. The conversation also touched on transport and logistics. An agreement was reached at the meeting to hold a Georgia-China Investment Forum the following month in Shanghai. The meeting was attended by the founder and Chairman of CEFC China Ye Jianming, Georgian Prime Minister Giorgi Kvirikashvili, and government ministers. In an official photograph accompanying the press release, one face that didn’t quite fit: tucked in the corner of the conference table was a person with no obvious capacity to attend. The face belonged to the colorful personality of Ivane Chkhartishvili. 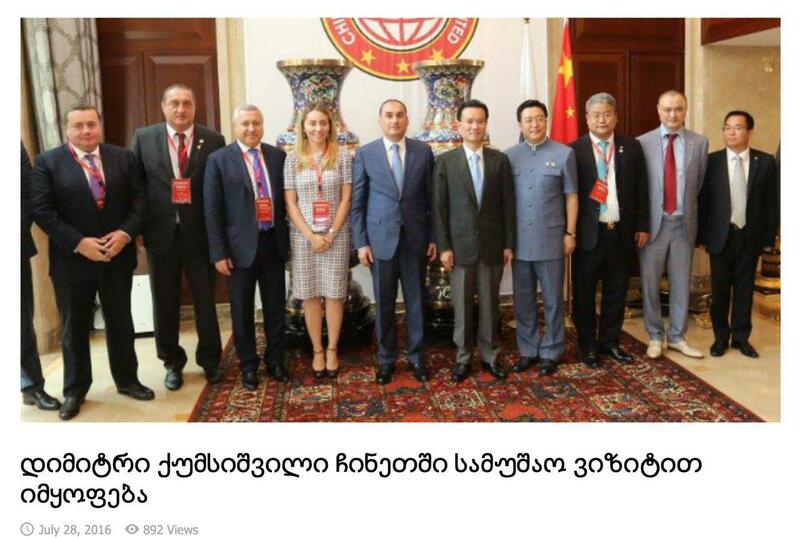 For the next two years, Mr. Chkhartishvili would become a regular feature in photographs and both media and official reports from meetings and other events involving CEFC and other Chinese entities, apparently enjoying exclusive government support in the budding Georgian-Chinese relationship. June 2016 meeting in Tbilisi between the Government of Georgia and CEFC representatives. Ivane Chkhartishvili in the far right corner. In Georgia, Ivane (“Vano”) Chkhartishvili is a person of some notoriety. After a career in the Soviet-time Komsomol, he became the first Deputy State Minister and later Minister of Economy in the government of Eduard Shevardnadze, formed after the paramilitary coup in 1992 that brought former communists back to power for eleven years on end. This period was marked by police brutality, torture and corruption. It was during this time that Minister Chkhartishvili founded the United Georgian Bank, which took over the savings of ordinary Georgians previously held in the Soviet Savings Bank (Sberbank). In 2002, Georgian opposition movement and civil society began a massive, peaceful campaign “Enough” aiming for regime change after 11 years of corrupt government run by ex-Communists, regrouped in the political party Civic Union led by Shevardnadze, Gorbachev’s last Foreign Minister in the USSR. The two names most forcefully denounced in the protests were the Minister of Interior Kakha Targamadze, a personification of the regime’s brutality, and the Minister of Economy Ivane Chkhartishvili, the face of its corruption. The movement culminated with the Rose Revolution that brought to power younger generation of Georgian politicians led by Mikhael (“Misha“) Saakashvili with the stated aim of ending corruption and establishing the rule of law. After the Rose Revolution, Chkhartishvili promptly fled Georgia alleging political persecution, and relocated to London. He didn’t avoid controversy there, either, and became embroiled in numerous court cases after the death of his business partner, another London-based expat and at that point the wealthiest Georgian Badri Patarkatsishvili. In 2012, Saakashvili‘s increasingly arbitrary rule came to an end with the electoral victory by the coalition of opposition parties called Georgian Dream, running mainly on anti-repression agenda. Georgian Dream (GD), led by the billionaire and now richest individual in Georgia Bidzina Ivanishvili, promised restoration of rights to all victims of Saakashvili’s abuses, including businessmen who had lost property due to extortion, blackmail and illegal pressure from law enforcement. Mr. Chkhartishvili was among those who returned to Georgia to claim justice. Unlike the vast majority of victims, he actually succeeded in restituting significant parts of his property during the first years of the GD government. The secret of this extraordinary success came to light in November this year, when Mr. Ivanishvili confided in an interview that he had been supporting Chkhartishvili all along. Already before that interview, Chkhartishvili had once again become the talk of the town in September after several audio recordings were released where he asks for “shares” and “percentages” from various businessmen. The story remains one of the most popular topics for Georgian media today. Given CEFC’s habit of engaging with controversial interlocutors, highlighted by the Patrick Ho’s corruption case in New York, it is perhaps not surprising that Chkhartishvili ended up playing such a prominent role in the conglomerate‘s offensive in Georgia. The CEFC story in Georgia stays true to their record elsewhere in other respects as well. CEFC has been promising investment in hundreds of millions in Georgia for more than two years now. Expectations are kept high by frequent MoUs, but so far the country has seen no real results, and given the company’s current state, it is hard to imagine any forthcoming in the future. The only party that seems to have handsomely benefited from the relationship is Ivane Chkhartishvili. There have been three big projects announced by CEFC and their Georgian partners. Contracts have been signed, announcements made, yet nothing happened. According to an MoU signed on May 14, 2017 at the high-level Belt and Road Forum in Beijing, CEFC committed $1 billion for a new Chinese commercial bank. This seems consistent with CEFC efforts to establish or acquire banks in places like the Czech Republic (J&T Bank) and Uganda (Crane Bank and Bank Africa). After a year and a half, however, no specific steps followed, and the project appears dead in the water. On the same day, also at the Belt and Road Forum, even more ambitious undertaking was announced: the creation of the National Fund for Georgia’s Reconstruction, in cooperation between the Georgian Partnership Fund and CEFC. The Reconstruction Fund was supposed to be in place in the fall of 2017. Georgian Partnership Fund, with the consent of the Government of Georgia, authorized an initial capital injection of USD 25 million as the Georgian share. The CEFC share apparently never arrived. Neither the Bank investment nor the Reconstruction Fund saw the light of the day, yet nobody asks any questions about the bombastic presentations from only a year ago. The third megaproject, CEFC’s “investment“ in the Poti industrial zone, likewise faded away. In October 2016, Georgian Deputy PM Qumsishvili, than Minister of Economy, argued in the parliament that Poti Free Industrial Zone (Poti FIZ), the first such economic zone in the region, was worth 100 million USD, and an investment package was discussed worth 600 million dollars. Almost exactly a year later, on September 18, 2017, the newly appointed Minister of Economy Giorgi Gakharia handed over 75 percent of Poti FIZ to CEFC for 10 million USD, with the condition of 150 million USD in future investment. While the 10 million dollars for the 75% stake appear to have been paid, there is no information about the promised investment, or indeed any activities in the Poti FIZ. Signing ceremony at the Georgia – China Business Forum in Shanghai, July 2016. Signing for CEFC is Executive Director Zang Jianjun (臧建军), for Georgian Government the then Minister of Economy Giorgi Gakharia. Ivane Chkhartishvili standing behind his minister. 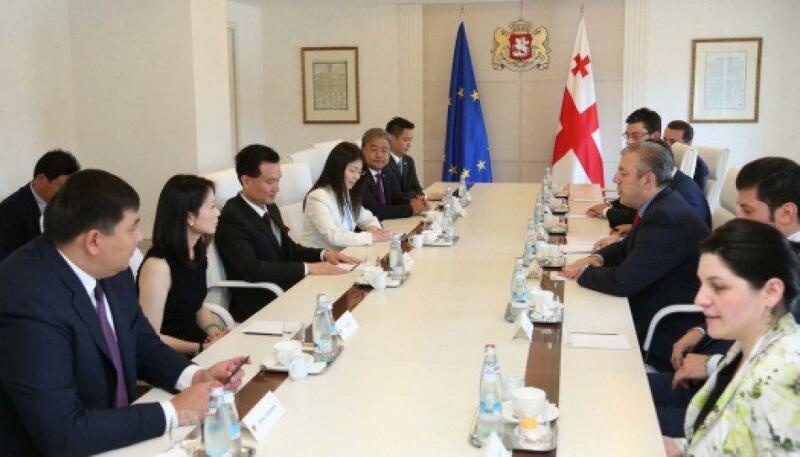 In July 2016, the Georgia – China Investment Forum was held in Shanghai on the heels of the initial government meeting with CEFC in Tbilisi, attended by deputy Prime Minister Qumsishvili, cabinet members, and of course Mr. Chkhartishvili. The Forum was a typical PRC arrangement where business is discussed in a high-level political setting, allowing high-ranking party officials to freely mingle with their select champions from the business world. The Georgian deputy PM talked up the potential of his country’s agro-industrial sector and pitched a $ 7 billion investment portolio to his Chinese counterparts; Mr. Chkhartishvili was conveniently at hand to exemplify that potential with the Shilda Trading company, which indeed promptly signed an MoU with Beijing Er Shang Group to import Georgian wine to China. Shilda happens to be a family-owned firm run by Natia and Mikheil Chkhartishvili, Ivane Chkhartishvili’s children. This transaction, part of a contract signed by Mikheil and Natia Chkhartishvili, is of unprecedented scale, as it is almost equal to the total volume of wine exported from Georgia to China in 2016. Specifically, Shilda was to export 5 million bottles of Georgian wine to the Chinese market over the next three years. By being in the right place at the right moment, and of course with the right political backing, the Chkhartishvili family got to monopolize the country’s main export to China, at least on paper. Beijing Er Shang Group (北京二商集团) is a company featuring in other countries where CEFC was trying to set up shop. In the Czech Republic, it was involved in a similarly politicized business relationship brokered by the former Governor of South Moravian Region, Michal Hašek. Er Shang was supposed to purchase Moravian wine at the value of 4 million € in 2016-17. In 2018, it was revealed that apart from samples, not a bottle of Moravian wine had been sold to China through Beijing Er Shang, and the company simply cut off all communication with their Czech counterparts. Chkhartishvili’s Shilda may have had better luck with the Chinese company, judging by wine export figures. In 2016, total wine exports to China from Georgia amounted to 4,886,145 bottles. In 2017, the figure rose to 7,585,407 bottles, with the increase possibly attributable to Shilda. Yet in 2018, the exports are down again by some 25%, close to the starting level. “Deputy PM Dimitri Qumsishvili visits China” (July 2016). On the Chinese side, full CEFC line-up. On the Georgian side, the Ministry of Economy officials — plus Ivane Chkhartishvili (far left). Another opportunity to mix business with politics came with the 25th anniversary of Georgia-China diplomatic relations, commemorated in Beijing in the summer of 2017 with an event again dominated by Chkhartishvili. This time, Vano Chkhartishvili was represented not just as a businessman, but also by his charitable foundation Georgian Chant, which sponsored the event. Incidentally, a year later, in July 2018, Georgian Prime Minister Bakhtadze issued a government decree granting 55,115 USD from the state budget to Georgian Chant for “covering various expenses”. No details were provided, but in the absence of other evidence it is entirely plausible that Georgian tax payers subsidized Mr. Chkhartishvili’s “charity” at a politicized event that benefited his business interests. Apart from Ivane Chkhartishvili, the other major interlocutor for CEFC and related China business in Georgia is David Saganelidze, head of the state-run Partnership Fund. Mr. Saganelidze has a long and productive history with Chkhartishvili. Hailing from the same Soviet-time Komsomol structures, Saganelidze is a former MP and the Georgian Dream Majority Leader in the parliament from 2012 to 2016. Before entering politics, Saganelidze made his fortune in business during Mr. Chkhartishvili’s ministerial times. The Partnership Fund he heads was created specifically for the purpose of attracting foreign investors, facilitating their activities in Georgia and promoting Georgian business abroad. According to official reports, it was the Partnership Fund that brought CEFC and other Chinese companies to Georgia and assisted them in their local endeavors. Concurrently with his position as CEO of Georgia’s Partnership Fund, Mr. Saganelidze has since 2016 also been an advisor to Huahe International 华和国际, a Xinjiang-based company established by a former government official named Liu Chuanwu 刘传武. 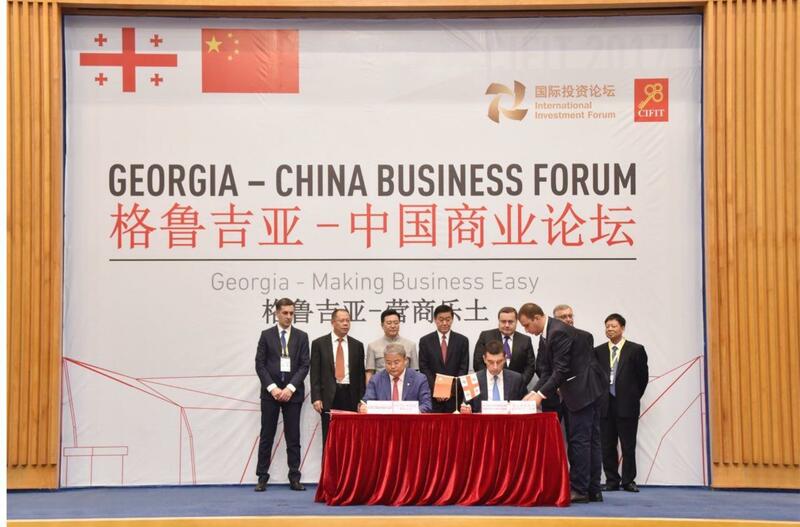 In March 2016, Georgian media reported that Huahe International and the Partnership Fund signed a Memorandum of Understanding for “Strengthening Trade Relations Between Georgia-China, Business Development and Investment”. This would seem to put Saganelidze and the Partnership Fund in an apparent conflict of interest, obscuring whom he was actually representing in negotiating the cooperation MOU. Such oddity is quite typical of the kind of arrangements that Chinese nominally private companies like CEFC often enter into. In the Czech Republic, a “Sino-Czech Center for Cooperation on the Belt and Road Initiative” was introduced in July 2017 at the Ministry of Trade and Industry (MTI) under arrangements first disclosed by Sinopsis, and only made public through an FOIA request from local journalists. In a set-up somewhat reminiscent of the 16+1 arrangement, the Center is managed in Beijing at the National Development and Reform Commission (NDRC), a super-ministry previously known as the Planning Commission. The implementation on the Czech side was ceded by the MTI to a private lobby group, the Mixed Czech-China Chamber of Commerce. The Chamber is headed by Jaroslav Tvrdík, former Defense Minister, and Štefan Füle, former Czech Euro-Commissioner. Both of them also represented CEFC Europe, the Czech branch of CEFC China, and now CITIC Europe, local subsidiary of the Chinese state-owned investment colossus that takes over from the troubled CEFC. (Tvrdík concurrently serves as an advisor to Czech President Zeman). PRC interest thus stands at both ends of the “mutual: Czech – China relationship, giving new meaning to the ubiquitous phrase win-win. Further contributing to the web of incestuous liaisons was the appointment of former Georgian PM Irakli Gharibashvili as a CEFC advisor. Curiously, Gharibashvili joined CEFC only in February 2018. By that time, the company was already deep in trouble: Chairman Ye Jianming diappeared at about that time, and Patrick Ho had been arrested three months earlier. Incredibly, despite all the media attention that the spectacular demise of CEFC attracted internationally, in Georgia, nobody seems to have noticed. In local media and public discourse, CEFC still features as a fabulously rich investor that will save Georgia from its economic predicament. That wishful thinking might now be in for some unpleasant surprises. Tinatin Khidasheli is the Chairperson of Georgian think thank Civic IDEA and Former Minister of Defence. With thanks to Nadège Rolland and Jichang Lulu.